Windows in Star Wars are often described as being transparisteel. Padme's maneuvers in Theed on Naboo at the end of TPM required blasting through transparisteel windows, leaving shards of it and broken permacrete (which we covered in a recent entry). The windows on Kamino are said to be transparisteel, as well as those of the skyscrapers of Coruscant, in the AotC novelization. We saw Kenobi jump through one. In the RotS novelization, the fighter canopies of the Jedi fighter are also said to be transparisteel, as well as the "view wall" on the Separatist ship's bridge with spidering cracks in it from a glancing hit from a starfighter, as well as Grievous's thrown spear blowing it wide open. And, in the TCW movie novelization, we learn that Palpatine's big office window is also transparisteel. Actually, the RotS novelization calls it "armored transparisteel". This is interesting given the fact that we've seen that window broken more than once . . . Windu takes it out with a single swipe of his lightsaber, causing it to fracture into a million pieces. 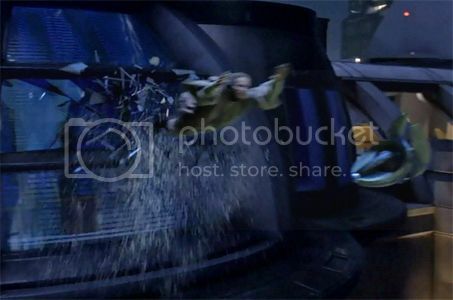 Cad Bane's takeover of the building in TCW featured clones rappelling down and swinging through it in "Hostage Crisis"[TCW1], with only a boot doing the breaking. Suffice it to say that other than the claimed pre-damage to the window from the RotS example, not visible in the film itself, there's no evidence of transparisteel being particularly interesting. Even armored transparisteel acts about like we would expect of normal glass . . . brittle and not resistant to much of anything. This is simply modern experience carried into science fiction . . . transparent things = glass = brittle material . . . that need not be correct. Indeed, it hasn't even been necessarily correct on our own world for a long time . . . things like plexiglass and transparent ceramics have been with us for awhile, and transparent aluminum apparently really was left behind by Scotty in the 80's, though it took awhile to get finished . . . probably because the guy was on a Mac. Transparisteel or transparent aluminum are terms suggesting a transparent metal, and thus they should act more like metal . . . bending instead of shattering, or breaking in a more metallic, tearing manner. Star Trek falls victim to this, too, what with the little circular window on the top of the bridge breaking open during the Generations crash. But no matter what, it's a bad idea. I keep getting the felling that things like durasteel, Transparisteel, eta are just brand names, and with all the corruption in Star Wars it would be easy to sneak low quality materials in.